Instantly export part or all of your data into multiple formats. 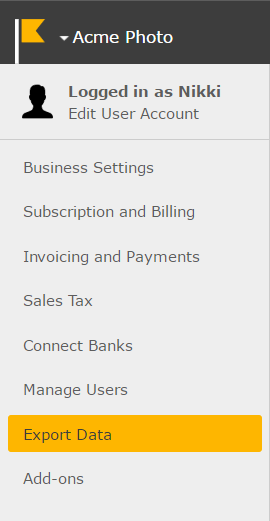 To access the Data Export page, go to Settings in the top right hand corner. 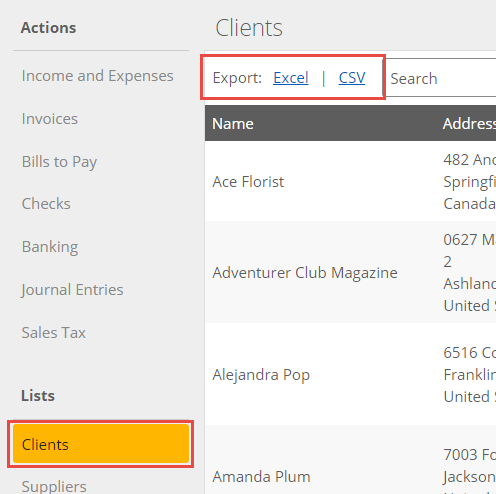 You can export your data in XLS (Excel), XML, CSV or IIF (QuickBooks). When you export from this area all the transactions and accounts associated with your business will be exported in 1 file. Please note if you are a multi-currency business you can't export to an IIF file format. If you want to export just a portion of your data you can go to that area in the software, enter your search criteria and then choose your export format. You can do this from almost every area of the software. This is how it looks in Clients.